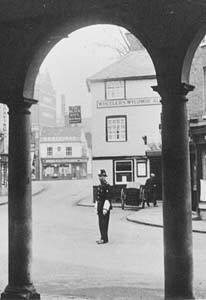 In the early 19th century two night watchmen were engaged to "police the town" of Chepping Wycombe. They were employed at a cost of 7/6 per week each, from the 25th March to the 29th September and from this day forward to 25th March when they were paid 10/6. The reason for the cheaper rate was that the hours of darkness were less from March to September. One of their duties was to 'Cry the Hour' at the Great Market House. This practice of employing night watchmen continued until 3rd February 1836 when James Cooper and William Venebles were appointed night constables, receiving the 10/6 per week - their duties being from 10.30pm to 4.30am. On Saturday and Sunday evenings one paraded at 8pm to 3am; they took this early duty alternately. They served in this capacity until 25th March when the job could be done more cheaply by two night watchmen on duty from 11pm to 4am at 8/- per week each. 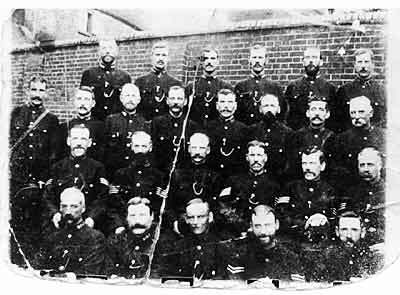 On the 29th September the constables were re-employed as before. 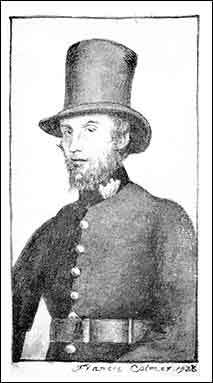 This practice continued until 6th February 1839 when the council decided to appoint the Beadle and Town Crier, Superintendent of police and on the 6th April George Davis was appointed to this position. He was to serve for forty years. His duties were to attend meetings of the Town Council prior to which the Council Bell was to be rung for a quarter of an hour, to attend the Mayor and Council at all public functions, to be caretaker of the Great Market Hall and keep it clean and to prevent trouble in the market houses and to remove vagrants from public places and maintain order during the day. This also included attending to the traffic on market days ensuring a free flow of carriages, wagons and carts. His duties commenced at 8am - earlier if required. He was to be dressed in a 'suit of police clothes', a hat with a silver braid and black shoes. His salary was £15 per year with a rent-free house in the churchyard. At first he recorded all crimes in a book but this was later changed and he had to report to the Mayor personally instead. The lock up was situated under the Great Market House and was kept in a poor and filthy condition. In 1840 the Superintendent's house in the churchyard was rebuilt and he was also issued with a new uniform the same used by the Metropolitan Police. This would have been a frock-coat, black belt, trousers, black shoes and a top hat. The following year his salary was increased by 5/- a week. He had to supervise the night constables, who now numbered three. They were required to parade at the Superintendent's house equipped with their staff, rattle, lantern and belt. Although there were now three constables they were still only employed from the 29th September to the 25th March. This continued until the 26th May 1849 when the local authority decided to reorganise the Force by appointing two full time officers in addition to the Superintendent at 12/- per week. They were issued with uniform, again similar to the Metropolitan Police, top hat etc. They also had a staff, rattle and lantern. (Around 1870 the top hat was replaced by the helmet). A sub-committee was appointed to draw up rules for the new force. At following meetings it was decided that the Superintendent was to be on duty at the time of evening service unless granted permission not to be there by the Mayor: then a substitute had to be present who was to wear an armlet and badge. In 1886 the Superintendent was granted fourteen days annual leave on the condition his son Harry was left in charge. The constables reported to the Superintendent's house for alternate daily duty - one from 7am to 5pm and the other from 10pm to 4am plus four hours of day duty. 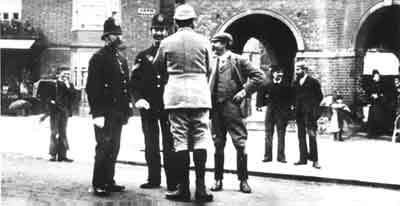 The Force only employed the two constables, John Westrup and Charles Pearce were elected policemen for the Borough. In the year 1851 the Force, now fully recognised, consisted of two constables and Superintendent Davis. In 1856 the committee was required by Act of Parliament to strictly enforce Police Regulations and the men were required to give their whole time to the job and not to have any secondary employment. To assist with this their pay was increased from 14/- to 16/- a week and the Superintendent to £90 a year. At the close of all Watch Committee meetings the constables and the Superintendent was required to be present so that they could be informed of any changes that had been decided. Constable Charles Pearce was not happy with the new arrangements and resigned his position in the force. He was later employed as the Beadle as these duties were no longer carried out by the Superintendent. A person by the name of White was employed in place of Charles Pearce. He was given one month's notice on the 13th March 1857 after he informed the Watch Committee he could not afford to live on constables' wage. Another constable was employed in his place. The Force still only had the two constables until the beginning of 1866 when the Watch Committee found the two policemen to be unsatisfactory and dismissed them, appointing instead three others - Constables Edwin Bulpit, Robert Slaymaker and William Norris. Constable Robert Slaymaker was later promoted to the rank of Sergeant - the first in the Force. The Old Police Station at Newlands. In1876 the Borough decided to use the old gaol in Newlands (built in 1816/17) as the Police Headquarters. Three new cells were built and the Buckinghamshire Constabulary was in charge of it but prisoners could be sent from the Magistrates Court making the old lock up under the Great Market House redundant. In 1876 the County Police built their own premises in Temple End and the Borough police took over the gaol. In 1879 George Davis retired and Thomas Collins of the Isle of Ely Constabulary took over the position of Superintendent of Police. The retired Superintendent was not to enjoy a long retirement as he died just four years later. During Superintendent Collins period of office a constable's pay was increased to 26/3 and a sergeant's to 30/11 a week. On the 11th June 1886 Inspector John George Fraser was appointed Superintendent and Inspector of Weights and Measures. One of his first jobs was to purchase three Government - approved birch rods for the flogging of juveniles. He also arranged for the constables to have one day's leave a month and also provided better liaison with the County Police. Other minor improvements included the fitting of "Borough Police" plates on constables' houses and the testing of 'silent boots' for night duty. More important improvements included the appointment of a Constable Clerk and the first detective to assist in checking gambling on licensed premises. In late 1890 Superintendent Fraser notified the Watch Committee of his desire to resign to become the first Chief Constable of the newly formed Eastbourne Borough Force. On the 12th January 1891 Oscar Dunnett Sparling was appointed Superintendent and Head Constable, allowing Superintendent Fraser to leave on 22nd February 1891. Oscar Sparling had transferred from the Bacup Borough Force. The term Head Constable was used on this occasion for the first time but the following year he was to be known as Chief Constable. This year also saw the use of armlets showing when an officer was on duty and a grant of seven days annual leave was obtained. Constables were also required to attend first aid lessons and a clock was fitted to the police station to encourage better time keeping of the officers. This year also saw the first large scale use of the Borough Special Constabulary during the General Election. All sixty men were congratulated by the council for their good work. By 1897 the Force had grown to one Chief Constable, three sergeants and 10 constables. A Merit Class was introduced for constables and sergeants who had served more than twelve years. In 1900 the station was connected to the Exchange of the National Telephone Company at a cost of £3.10s a year. The County Police were also connected at the same time. In 1913 George Powell Stephens from the Metropolitan police was appointed Chief Constable. He remained throughout the First World War until 1919 when William Thomas Jones succeeded him. William had been with Chepping Wycombe Borough Police since 1914 when he was appointed the first Police Inspector of Weights and Measures. He had previously seen service in the Oxford City Police. with not a car in sight! 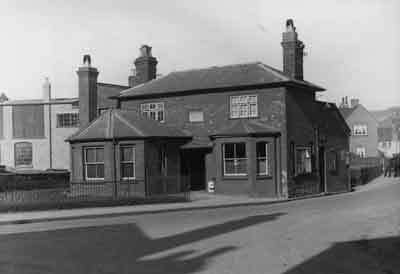 In 1935 the new police station in Queen Victoria Road was opened and the officers, who now numbered thirty-one, moved in. The new station cost £13,572 to build - a far cry from today's prices. 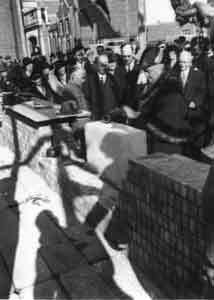 Prior to its completion the Mayor Councillor Brocklehurst laid the foundation stone. Underneath this stone was placed a sweet jar, obtained from the local sweet shop by PC Robert Laurie, who incidentally met his future wife in the process. It would be called a "time capsule" today. It contained a parchment with names of all the serving officers at the time, coins, badges and the latest copies of the Bucks Free Press and the Times plus a number of other odds and ends. 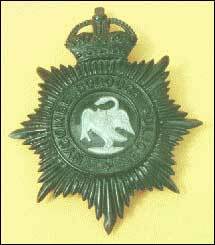 On Tuesday 1st April 1947 the Force, with an authorised establishment of forty-five men, amalgamated with the Bucks Constabulary. The night before the amalgamation at the 10 o'clock parade the atmosphere was very different. No leg-pullling, jokes or friendly banter were to be heard. The officers were fully aware that this was the last ever parade to be held by the Chepping Wycombe Borough Police. The status of the building was to become that of the Divisional Headquarters and William Jones retired after nearly thirty-three years service in the Force, twenty-eight of them as Chief Constable.